Home › BLOG › Super Food in Hand! How about adding an addition to your nutritional line-up this summer? : Hüma Energy Gel. Hüma Energy Gel uses chia seeds, an ancient superfood, to fuel runners across the miles. And while it may be hard to get the chia pet jingle out of your head (“Ch-ch-ch-chia!”), check out why this superfood once powered mighty Aztec warriors and was considered more valuable than gold—and how it can help you train stronger than ever. After five hundred years of relative obscurity, chia seeds are making a popular resurgence due to their wide-ranging health benefits, from weight loss to gastrointestinal health to mental wellness to, yes, sustained endurance for athletes. The nutritional and medicinal properties of chia seeds have made cameo appearances in mainstream media such as CNBC, The Wall Street Journal, and the Dr. Oz Show, as well as magazines like Trail Runner and Running Times. Chia seeds have even made their way onto the NFL gridiron; Baltimore Ravens’ star linebacker Ray Lewis tosses a handful in his shake every morning. But the superfood really skyrocketed to fame with its starring role in the best-selling book, Born To Run, which describes chia seeds as the indigenous (and seemingly magical) dietary staple of the Tarahumara Indians, a tribe of super-runners in the savage Copper Canyons of Mexico, who can chalk of hundreds of miles with Scott Jurek speed, virtually no rest, and shoes that would lose a fistfight against a paper plate and some twice-used dental floss. But before you start grazing off the “Mr. T” Chia Head sitting in your windowsill (actually, don’t do that—the seeds in the Chia Pet package and the seeds in your local grocery store are not one and the same), remember that even a superfood is terrestrial; there’s no such thing as a magic running potion (sadly). But chia seeds do provide a boatload of nutrients absolutely essential for runners, nutrients that improve endurance, reduce inflammation, and accelerate recovery. How? Because chia seeds absorb thirty times their weight in water, they help regulate body fluid levels and retain electrolytes, both key in the battle against dehydration. For long workouts in high heat and humidity, chia seeds are a handy way to prolong hydration. Omega-3 essential fatty acids (think fish oil) are a proven anti-inflammatory, and chia seeds are full of them. 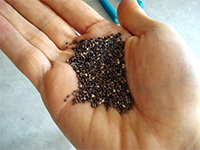 In fact, the Aztecs ate chia seeds to relieve knee pain. In addition to battling aches and joint pain, the essential fatty acids found in chia seeds alleviate skin problems, promote brain health, and have even been show to decrease the symptoms of hyperactivity disorder and hypertension. Hüma Energy Gel tastes great and is made with 100 percent real food ingredients including finely-blended chia seeds. The combination of all-natural ingredients and the high water content formula make for an easy to swallow gel with fewer GI issues. The 2:1 glucose-to-fructose ratio combined with all nine essential amino acids give you maximum boost. 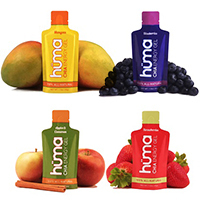 Hüma Energy Gel is gluten free, dairy free, and vegan friendly. Flavors include Strawberry, Blueberry, Mango, and Apple Cinnamon. It's pretty tasty and has fueled me through many long runs as well as the Big Sur Marathon... And... I'm pretty picky. Don't just take my word for it... Try some for yourself today!